Snarky Geeks Episode 154 - ...Four Horsemen! 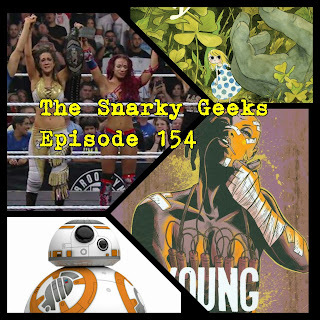 These two Snarks bring their third year to a close!, They talk of the journey, The ups an downs of this silly podcast, Then it's on with the show as they review The Iron Maiden album Book of Souls, DC's sales woes, Star Wars merch, BB-8, Digneto, Sasha Banks and Bayley bringing the house down, Then they review Beautiful Darkness from Drawn and Quarterly and Young Terrorists from Black Mask, and much more , and the Sorry-List! .... you really have to listen to the whole show!